With the Asus Eee PC being so popular, there’s a lot of people looking to improve the real estate of their small computers. Here’s an update to my previous post to get fullscreen higher resolution on your monitor, be it small or big. 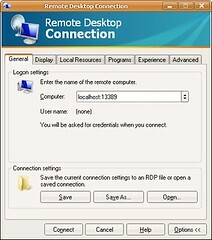 To make it clear: even though this technique uses Remote Desktop, it connects to the local machine only, there are no remote computers involved, no internet connections required. the need for a port forwarder. Enterprising users found solutions to both problems, so I think it’s time for an update! Follow the instructions from here to create a .rdp file and add “smart sizing” to it. Set the server to “127.0.0.2”. Note that normally the local computer is 127.0.0.1 but Remote Desktop will not let you connect to that address. Connecting to 127.0.0.2 works however, which is strange but convenient! Update: Paul in the comments mentioned that the CTRL-ALT-PAUSE/BREAK key combination makes the remote desktop window fullscreen. It works great! No need for additional software. Download one of those applications (Desktop Enhancers) that make any window fullscreen. I use the shareware FullScreen 2.5, but if you find a good one as freeware please do post it in the comments. I might write one at some point if there’s a demand for it. That’s it! When you want high-res, simply log-in with your new account, start the connection by double-clicking on the .rdp : you’re connected as your usual user, ctrl-right click on the title bar to go fullscreen and voila. No matter whether you’re a Windows lover or hater, there’s no denying that Remote Desktop is one of the greatest features of the system. It beats VNC and many other remote control solutions by far for its sheer speed and picture quality (although of course VNC is genius for the fact that it works on Linux and Mac). One gripe I have had with Remote Destop for years though is that I want to be able to connect to my desktop machine at its native high resolution from my laptop which has a lower resolution. Scaling isn’t that hard! Don’t give me those scrollbars, they are just useless. Both TightVNC and MaxiVista (and many others) support scaling the remote screen and it looks very good, so it’s been frustrating not to have the feature in RDP. Configure your remote connection from the GUI as usual. In “Local Resources, make sure that “Apply Windows key combinations” is set to “On the remote computer”. Save the connections settings to a file in a sensible directory. Call it for example “Remote.rdp”. Change the desktop width and height to what you want (for example 1600 and 960 to keep the aspect ratio). You’re done! Save and quit Notepad. Double click on Remote.rdp, you’re connected at high resolution! Using this extremely simple tip (hacking with notepad! where have the hex editor days gone ?) you can crank up your resolution to 4096×2048, if you don’t mind not being able not to read anything. I find that a factor of roughly 1.25 is sensible.